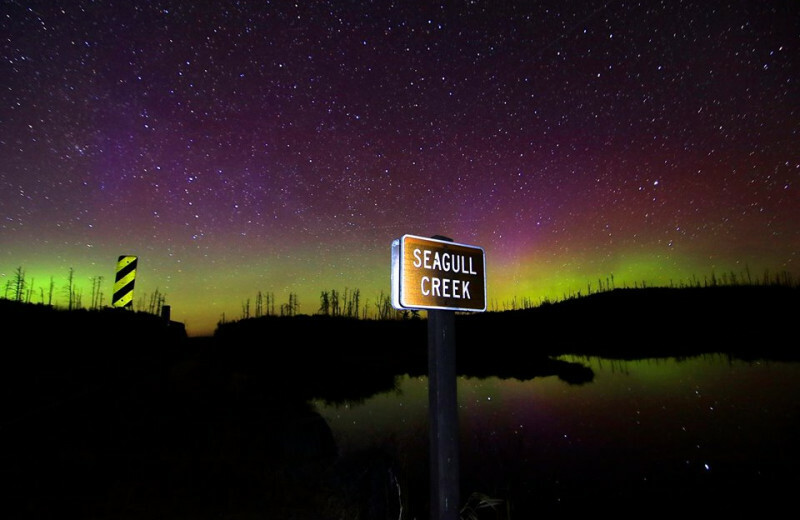 In the Minnesota Northwoods, You'll Find the Perfect Blend of Luxury and Adventure! 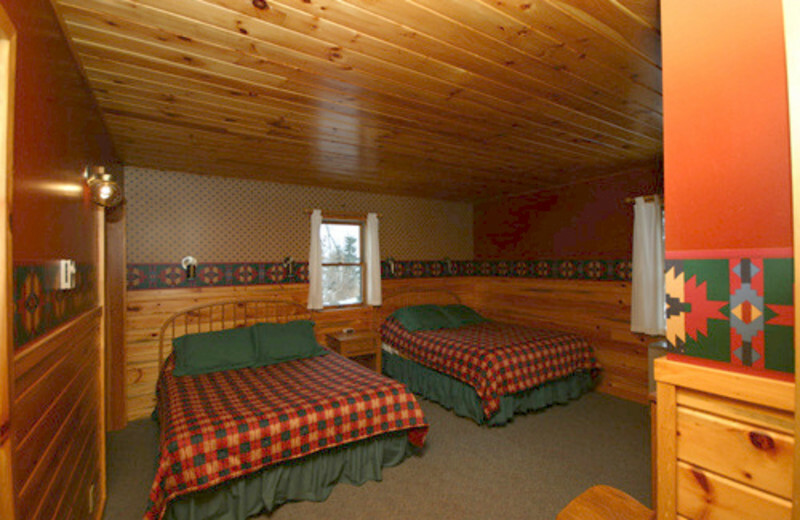 Gunflint Lodge is an exhilarating touch of class and warm elegance on Minnesota's North Shore. 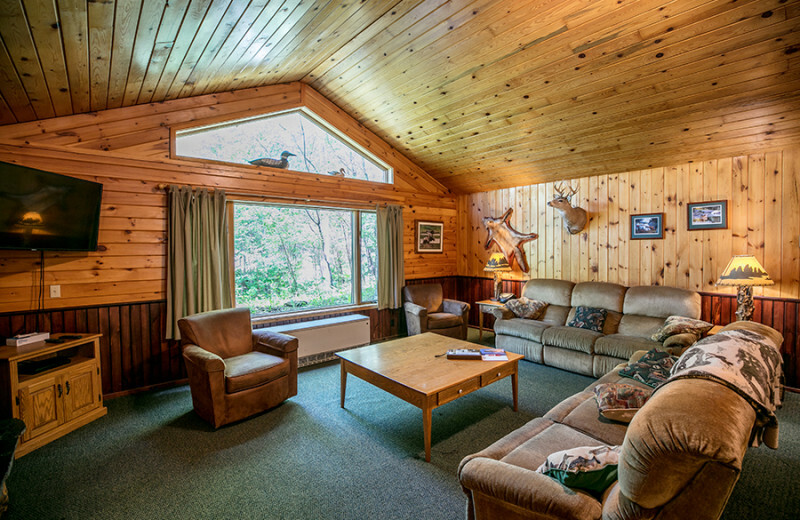 Families, fishermen and everyone in between will be captivated by this remote yet thoroughly accommodating beachfront lodge in the famous MN Northwoods. 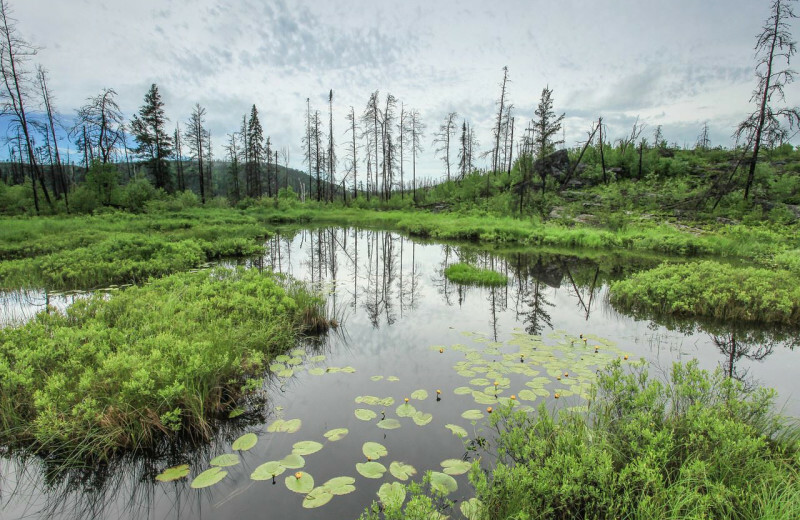 You'll have your choice of adventures near the Canadian border - guided fishing and naturalist excursions, horseback riding, snowshoeing and, of course, canoeing in the Boundary Waters Canoe Area, the largest canoeing wilderness in the U.S. 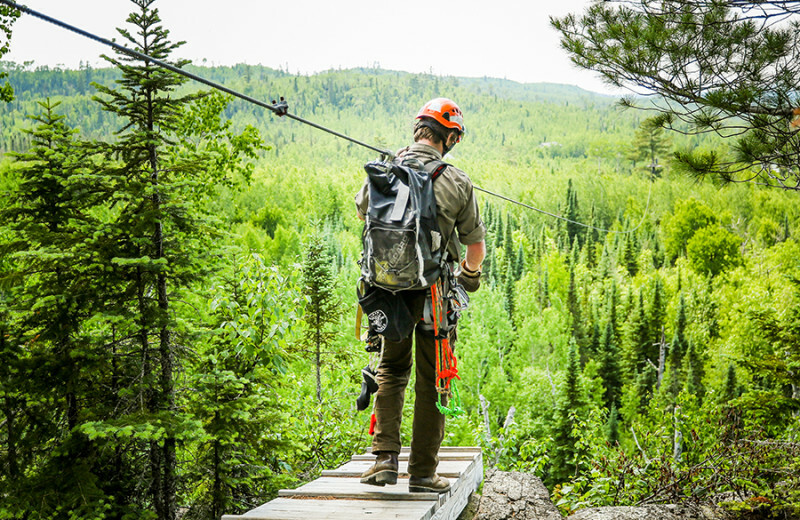 In winter, the Gunflint Trail thrives with 200km of cross-country trails just outside your door. 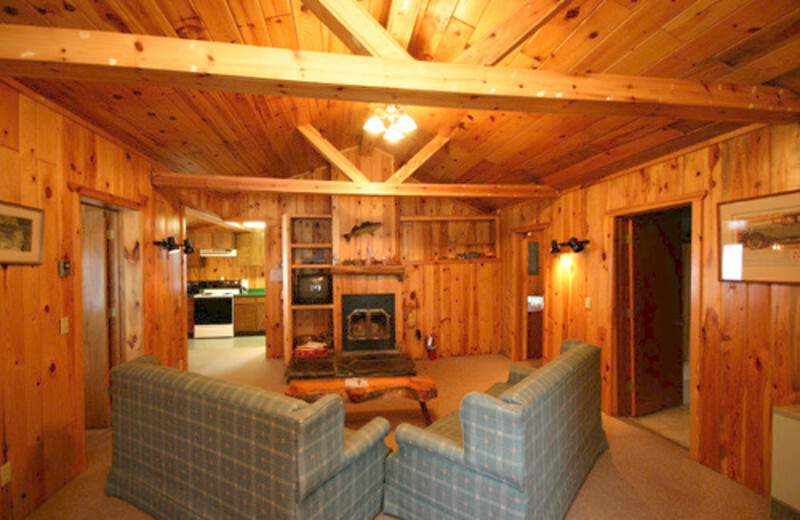 Elegant, romantic and spacious cabins and lake homes feature fireplaces, music systems and whirlpool spas. 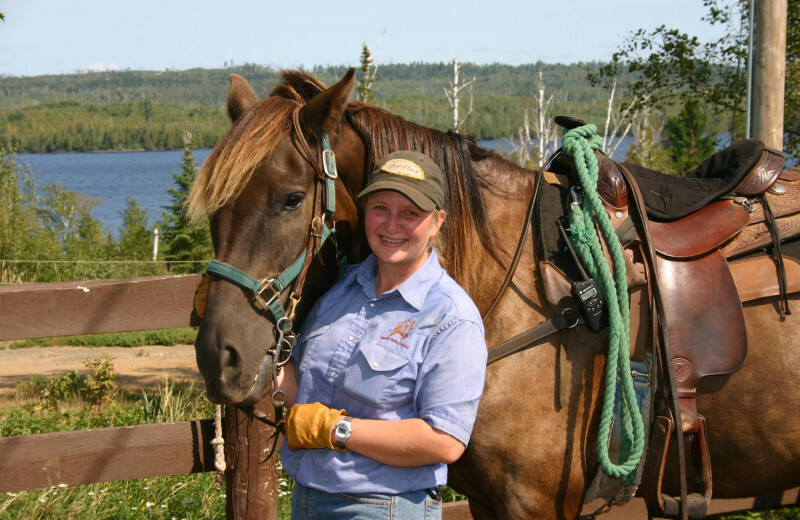 A full time massage therapist is part of the team at Gunflint Lodge making it an even more special experience! Head to the North Shore today! 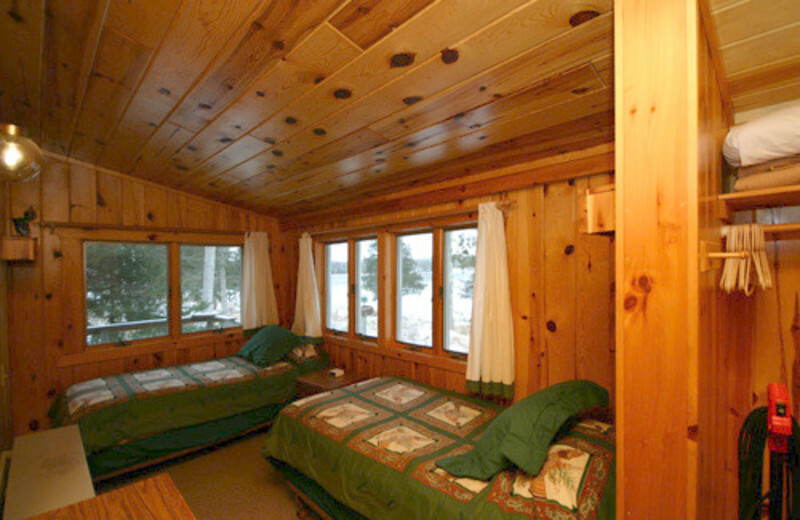 In any season, night or day, organized or on demand, Gunflint Lodge has an activity package for you. 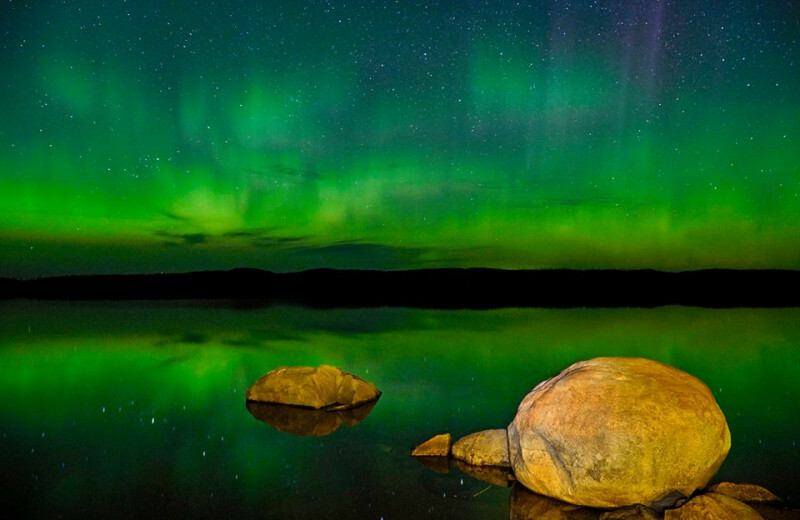 Take a guided day trip to the Minnesota Boundary Waters. Hike, ski and watch wildlife by moonlight. Hear about legendary Great Lakes shipwrecks. The fun never ends... and it's all included in your rate! 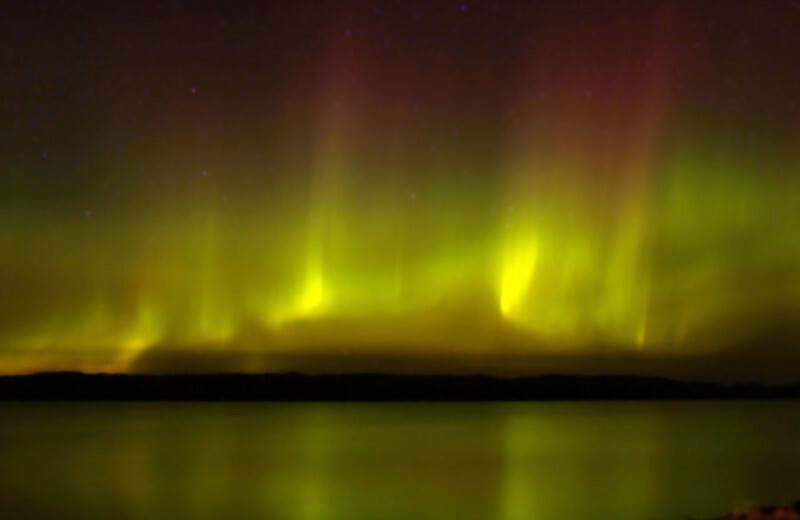 Head to Minnesota's North Shore and enjoy a beautiful lake vacation! 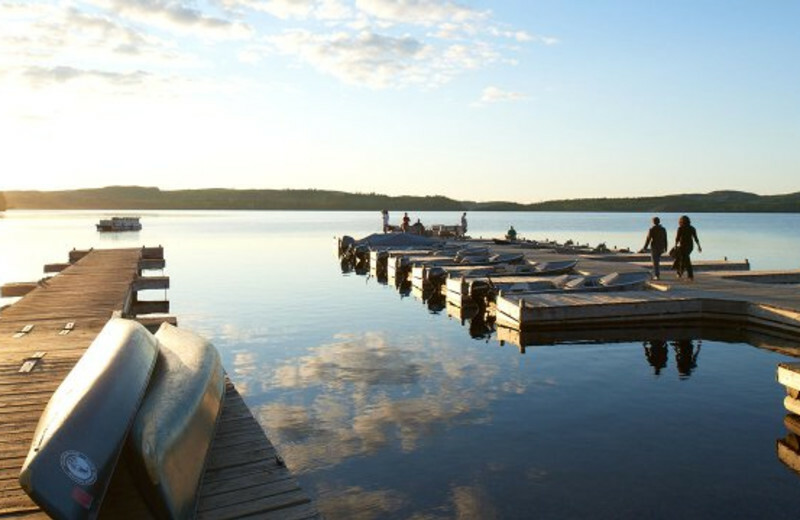 When you stay at Gunflint lodge, you'll be right on Gunflint Lake and near the Boundary Waters. Rent a boat, head out splashing in the water, or just kick back with a good book! However you choose to enjoy your beach vacation is up to you. Book today! 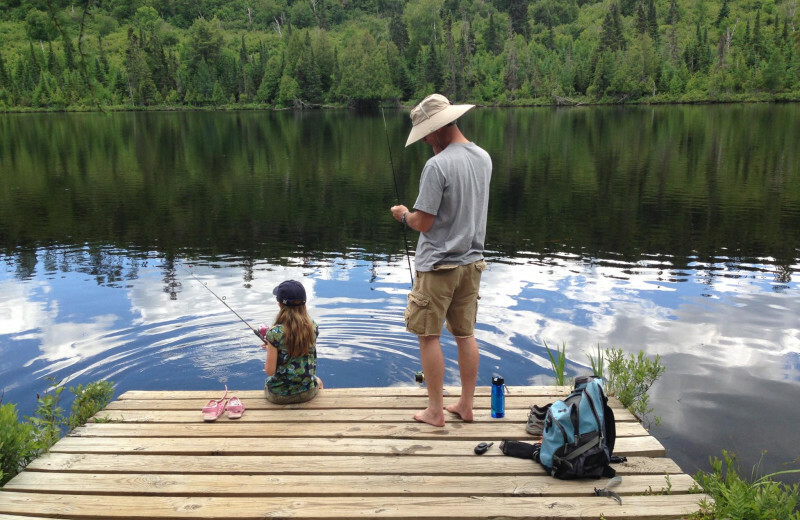 If you've never heard of the Kerfoot family in this area, you will: they've been here for four generations, providing Minnesota family vacations and Northwoods adventures of a lifetime. 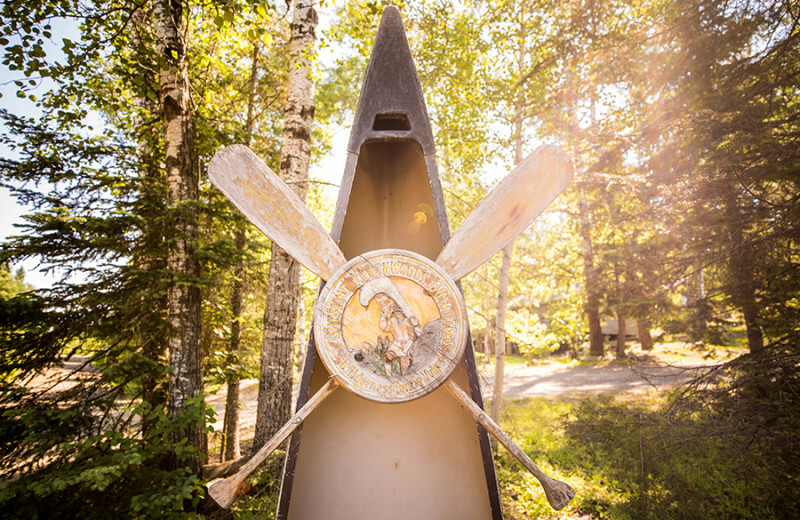 You'll love the hospitality here; let the Gunflint Lodge naturalist or guides take you on hikes, lake cruises, and much more. It's the perfect place for that fun-filled family vacation you've been meaning to take! 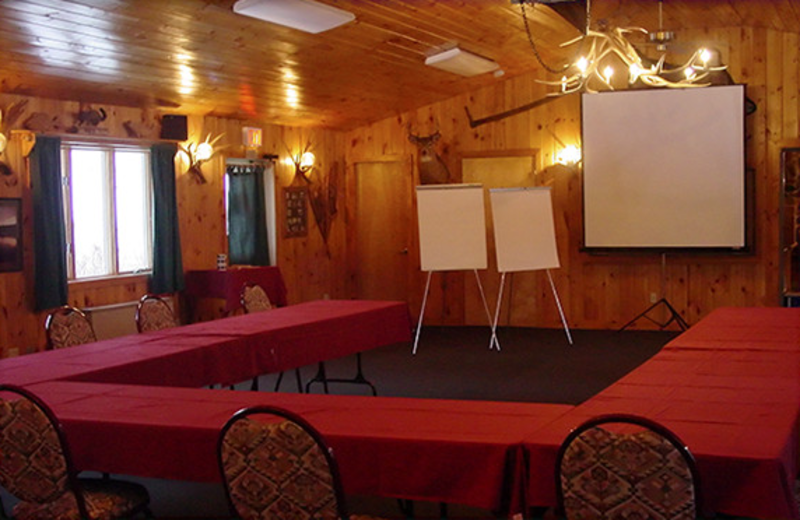 Let the staff at the Gunflint Lodge help you plan the perfect corporate retreat during your stay in Northern Minnesota. 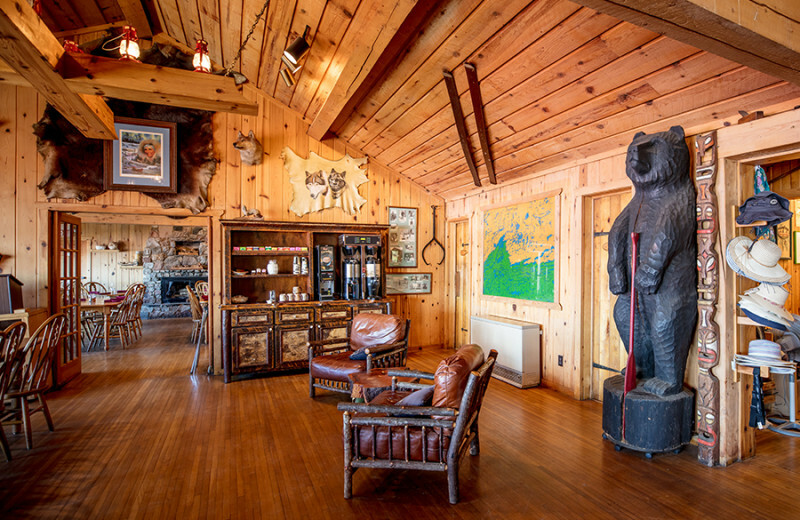 Reserve the Pow Wow Lodge, a five-bedroom, three-bathroom one story unit complete with a gourmet kitchen, fireplace and entertainment room, perfect for small group discussions and meetings. You'll be sure to enjoy a refreshing and productive getaway with your team! 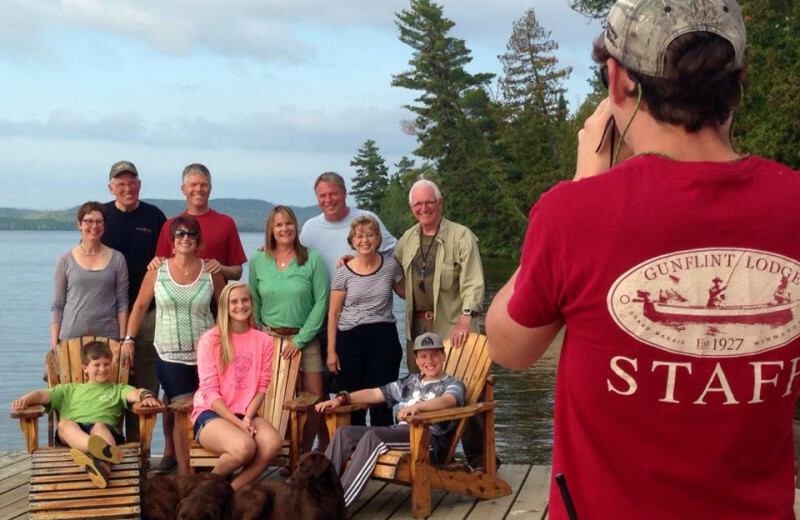 What's better than a family reunion surrounded by the beauty of Northern Minnesota? What about an all-inclusive package with unlimited outdoor activities including hiking, fishing and boating? 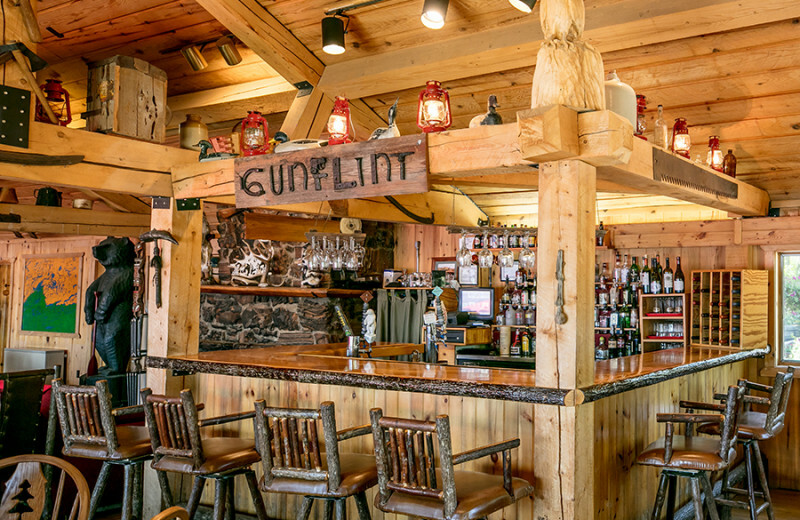 All of this and more is available when you plan your next reunion at the Gunflint Lodge! Spacious accommodations ensure everyone has a place to stay comfortably! 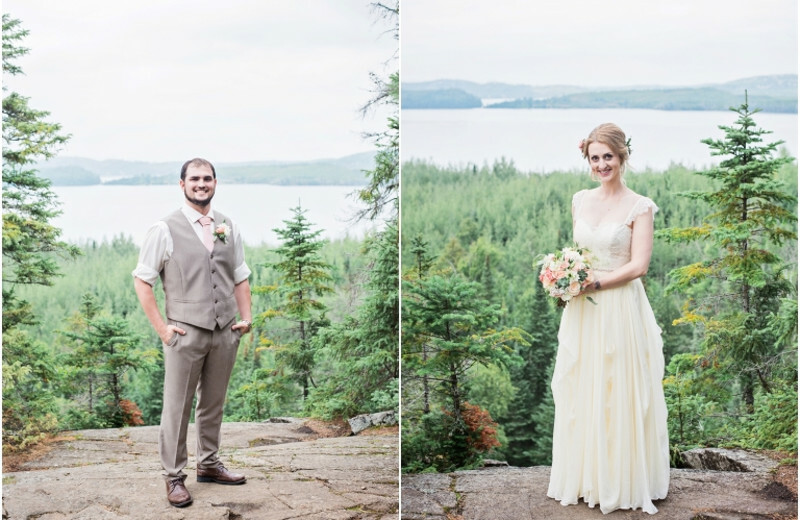 Take the planning out of your wedding ceremony, and escape to the Gunflint Lodge to take advantage of the Elopement/Honeymoon Package. 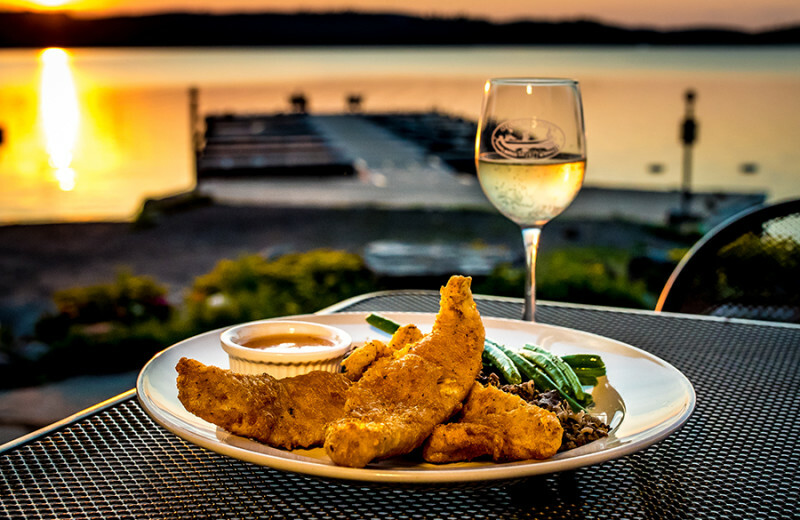 Included in this deal is a wedding dinner with champagne, three nights in a romantic lakeside cabin and plenty of Northwoods activities. The lodge will even provide two witnesses to certify the event as official! 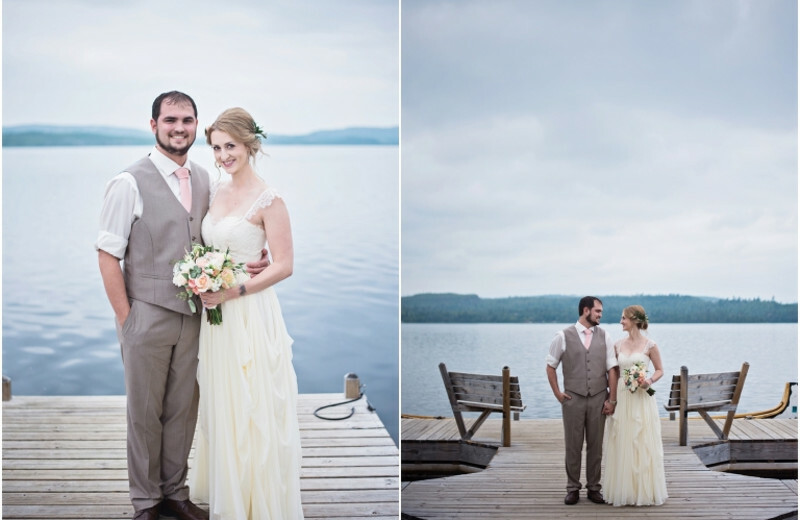 Forget about the hassle of planning a big wedding, and make it an intimate affair at Gunflint Lodge. 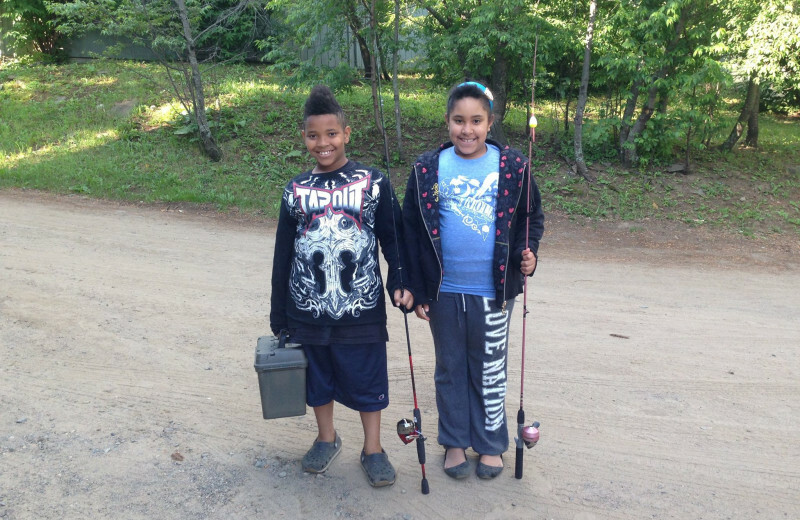 From the bountiful bass fishing waters of Gunflint Lake, to the exceptional Northwoods beauty that surrounds you at every turn, Gunflint Lodge provides the perfect vacation destination for outdoor lovers. The all-inclusive package at the lodge will allow you to experience this stunning area by hiking, horseback riding or boating. 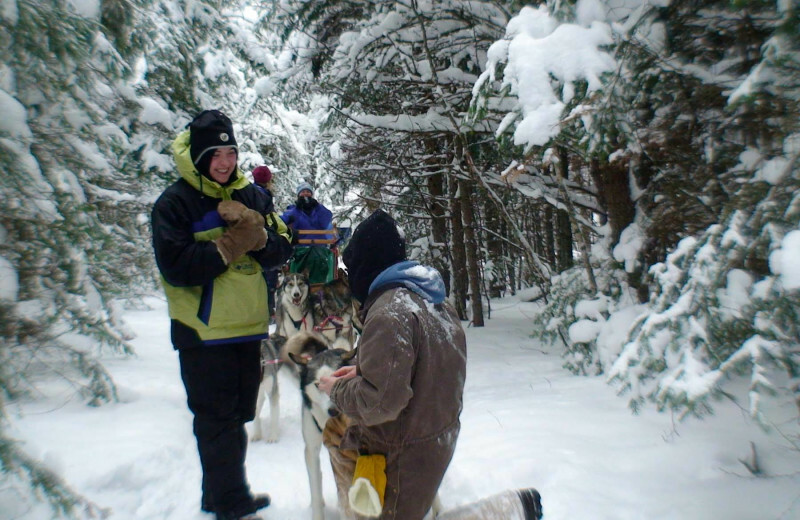 When the snow starts to fall try a dog sledding excursion, or explore the heavily wooded area on cross country skiing trails. 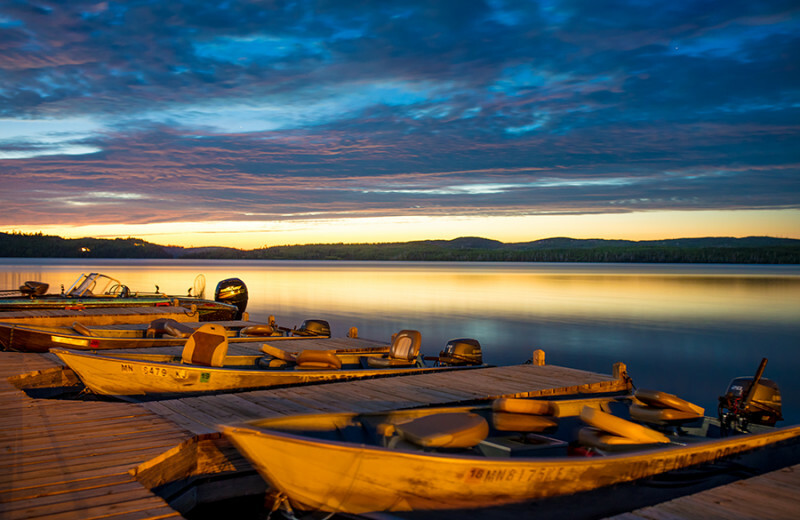 Gunflint Lodge works with expert guides to provide the best fishing experience possible. 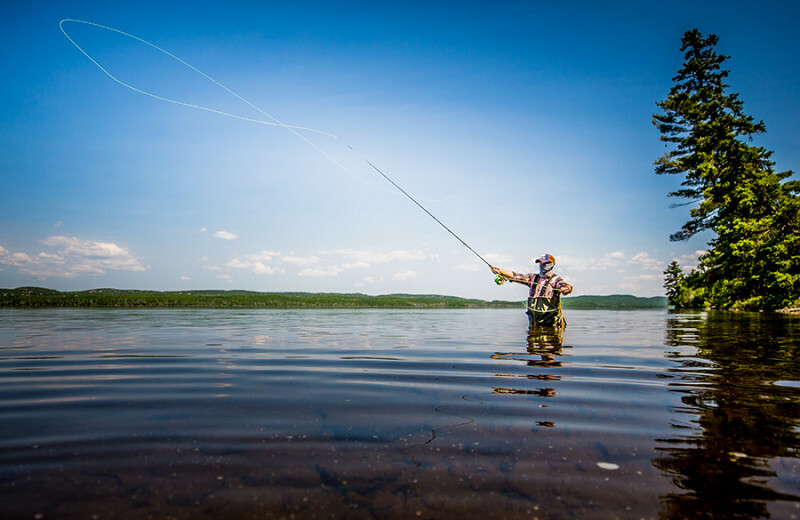 They know the North Shore's most coveted fishing spots - amazing lake trout, northern pike, smallmouth bass and walleye, some of the state's largest, are here in Gunflint Lake. Enjoy Minnesota fishing all year – even ice fishing from January to mid-March! 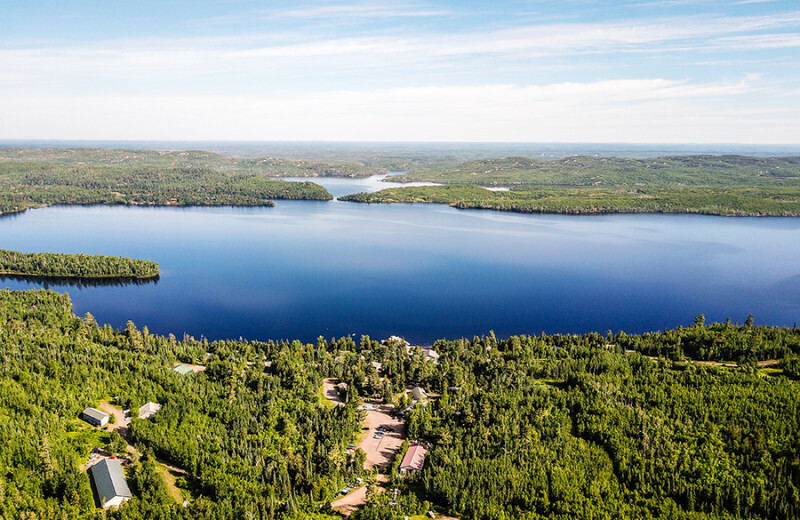 At Gunflint Lodge, glistening waters, the sounds of the local wildlife, and cabins with double Jacuzzis combine for a Minnesota romantic getaway like you've never experienced. Many of the activities, such as hiking and horseback riding, are perfect for two. Plus two onsite restaurants offer culinary delights to enjoy together! A full time massage therapist can treat the two of you to a romantic massage! When the snow begins to fall, one of the best ways to explore the area surrounding Gunflint Lodge is cross country skiing. 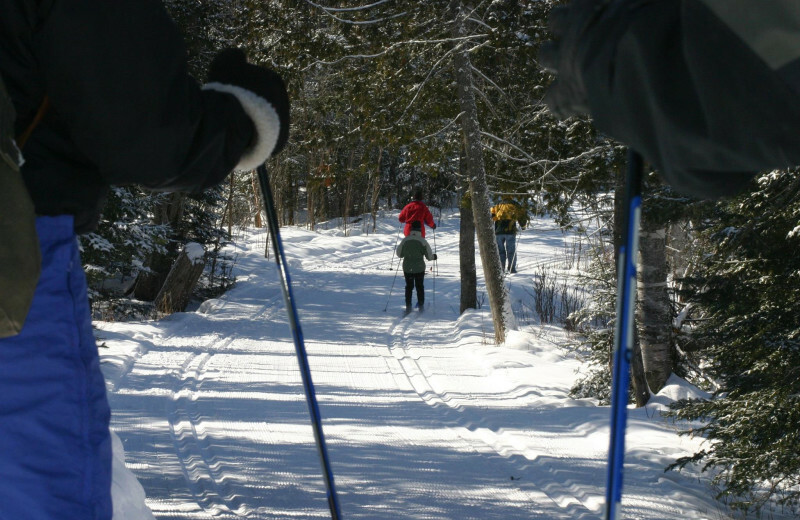 Make sure to schedule a skiing excursion around Gunflint Lake, just another one of the great activities available with your all-inclusive package at the lodge. Numerous nearby trails ensure you won't have to take the same path twice! 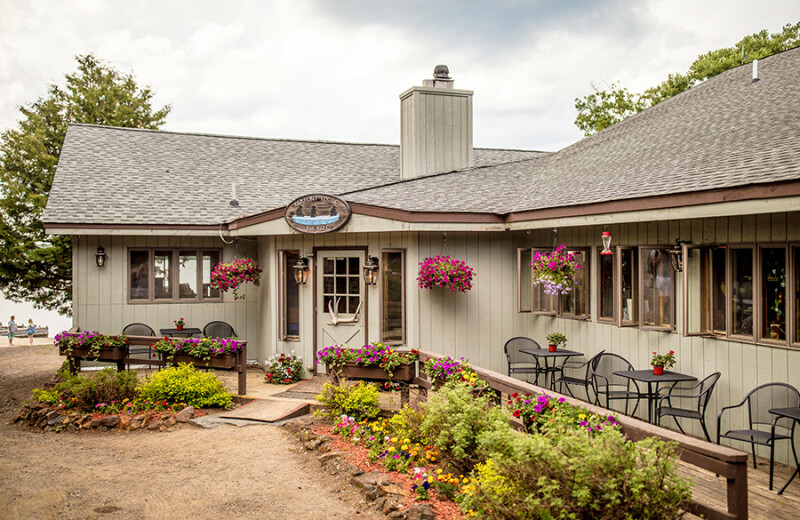 For those guests who prefer traveling with their favorite furry friend, the Gunflint Lodge offers pet friendly accommodations during your stay in Grand Marais. 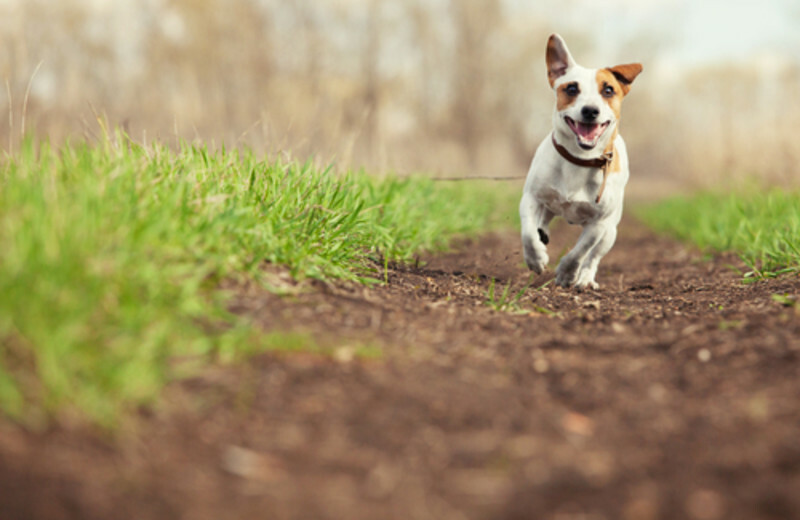 Take the worrying out of finding someone to take care of Fido while you are away on vacation, and bring the entire family with you! Remember - pets need vacations too! 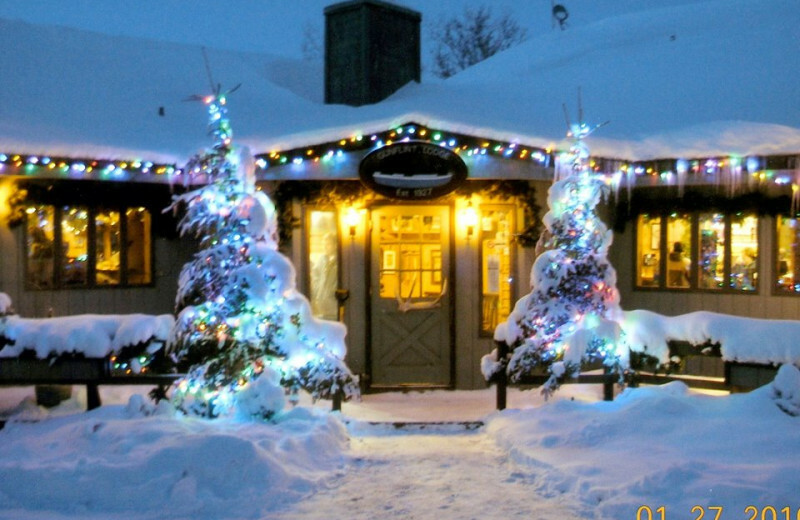 Gunflint Lodge is located in one of the most beautiful and well preserved areas in the United States, in Minnesota's North Shore. Teeming with native wildlife and stunning bodies of water, the North Shore is sure to leave a lasting impression. 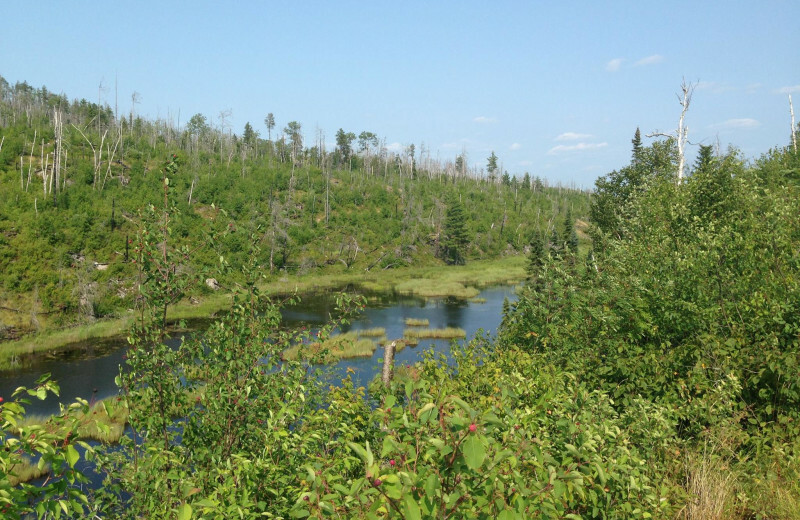 Learn about how you can preserve this beautiful area, which includes the Famous Boundary Waters, when staying at Gunflint Lodge! 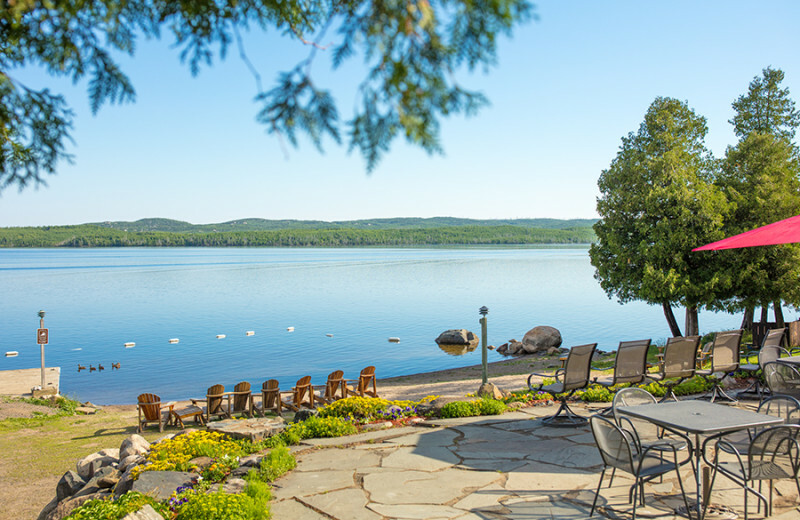 You don't expect to find these pampered surroundings in the Northwoods: luxurious cabins and lake homes feature kitchens, saunas, washer/dryers and stunning hardwood interiors. 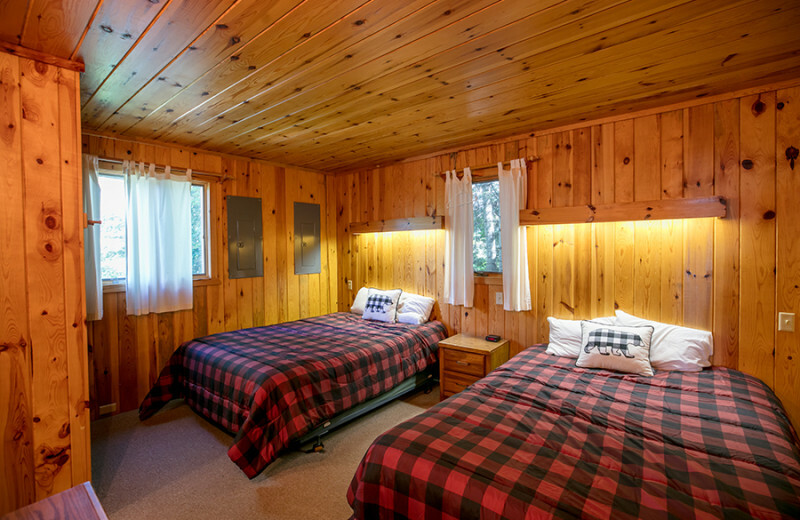 Even the privacy – there aren't any telephones or TVs – adds to the unique feeling of wilderness comfort at Gunflint Lodge. Experience a truly one-of-a-kind getaway at this Minnesota lodge. 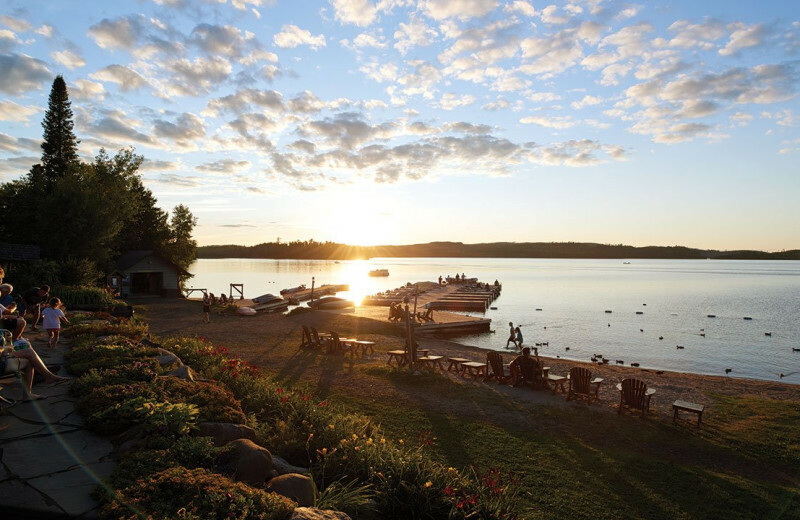 Gunflint Lodge rests on the shores of Gunflint Lake, a combination of thrilling recreation, privacy and stunning beauty. You'll find a peaceful beachfront here, and activities range from sandcastle building to fishing to water-skiing. 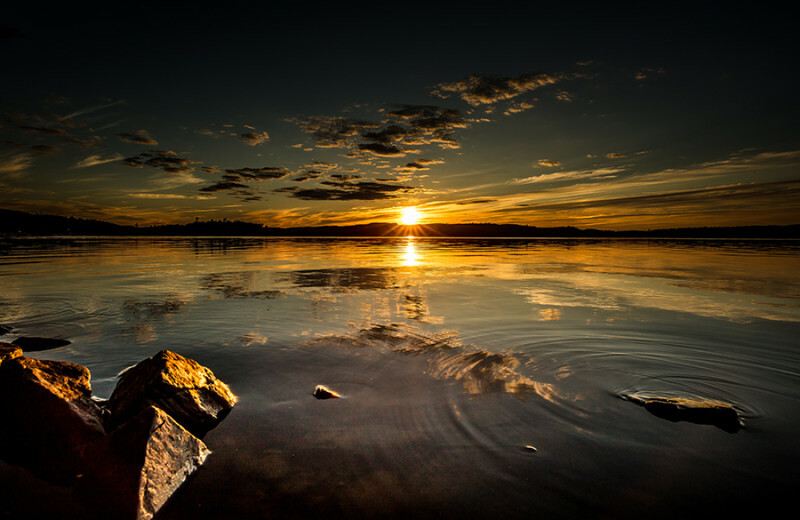 This Minnesota lake is a source of year-round fun and relaxation. 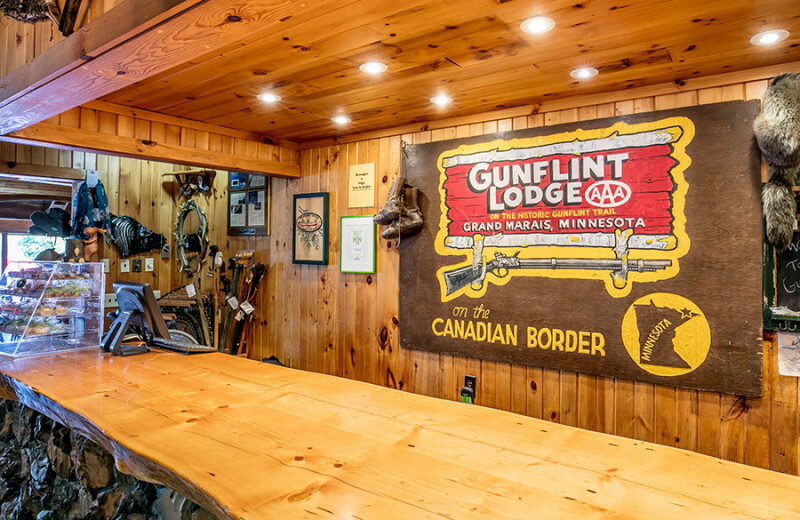 The Kerfoot family has been around the Gunflint Lodge for four generations, providing Minnesota family vacations and Northwoods adventures of a lifetime. 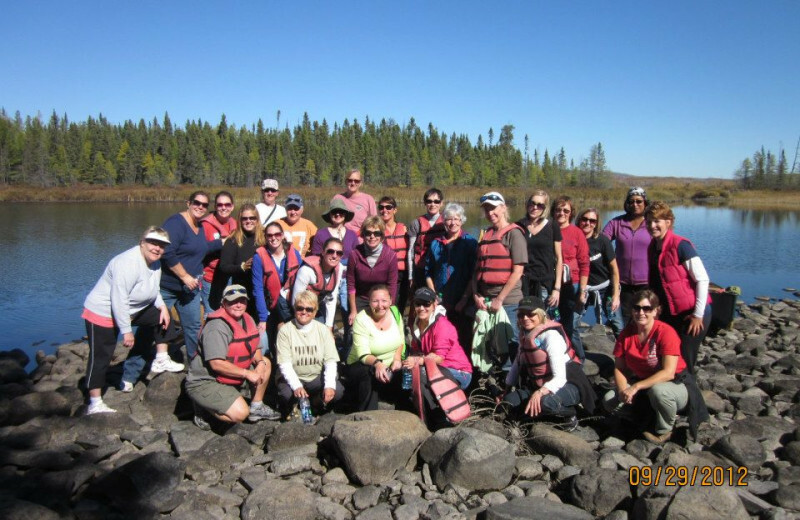 They'll be happy to provide information on the history of the area, including stories of shipwrecks and information and the famous Boundary Waters! 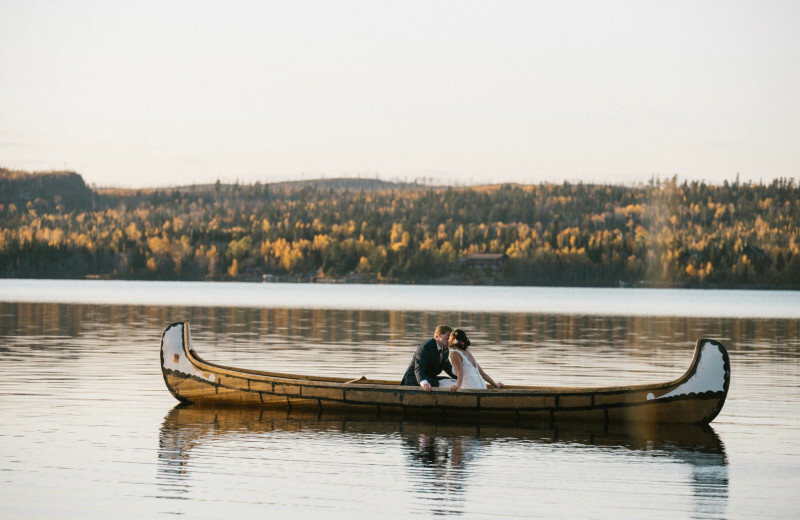 Enjoy a private and intimate getaway when you plan your honeymoon at the Gunflint Lodge. 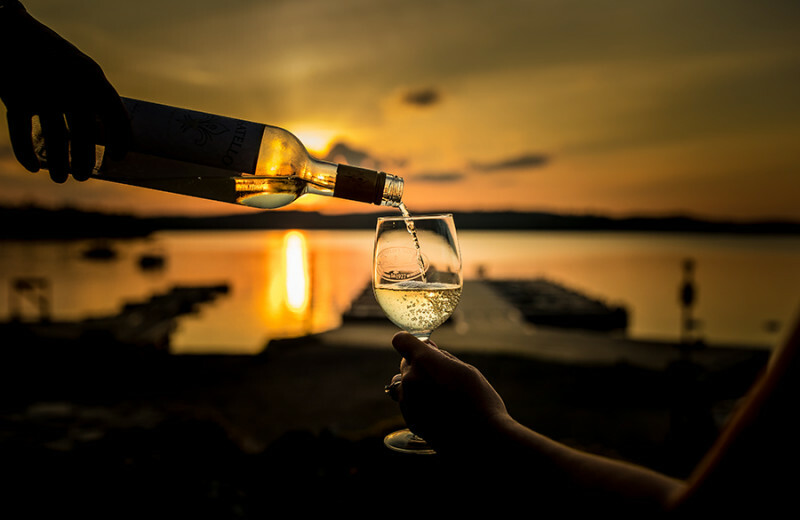 You won't have to lift a finger as meals, wine and appetizers will be delivered to your cabin throughout your stay. 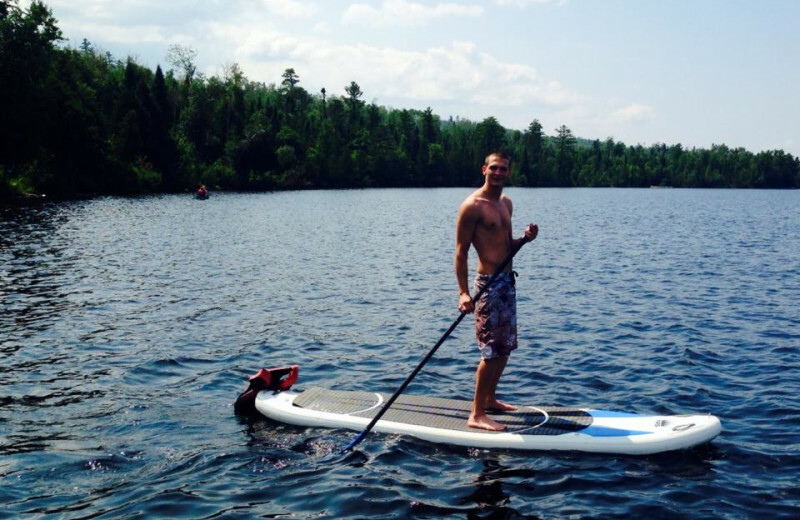 If you are looking for outdoor activities, enjoy a day of hiking, boating or kayaking. 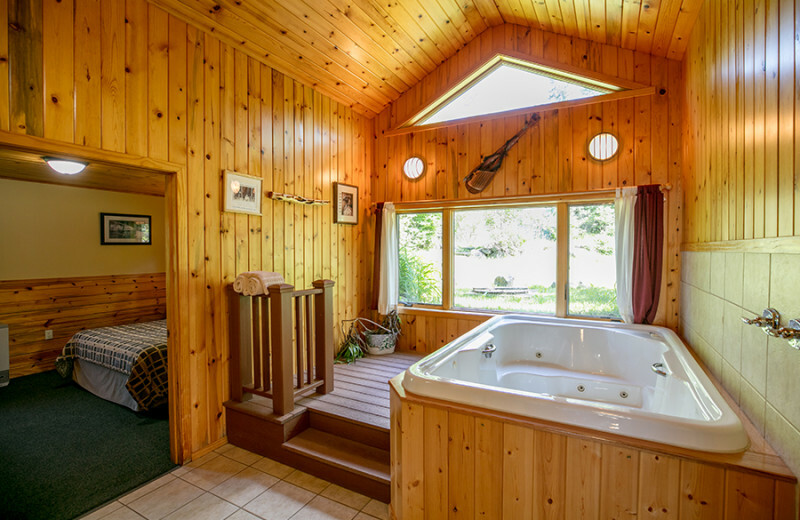 Reserve your romantic cottage and enjoy a jetted tub and stone fireplace during your unforgettable getaway. 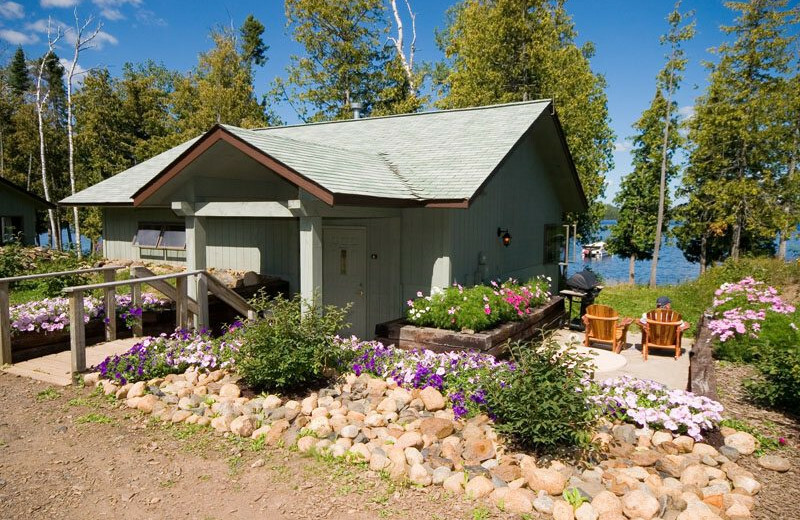 Gunflint Lodge is known for its luxuriously appointed Minnesota cabins and lake homes, including full kitchens, Jacuzzi tubs, private saunas and more. 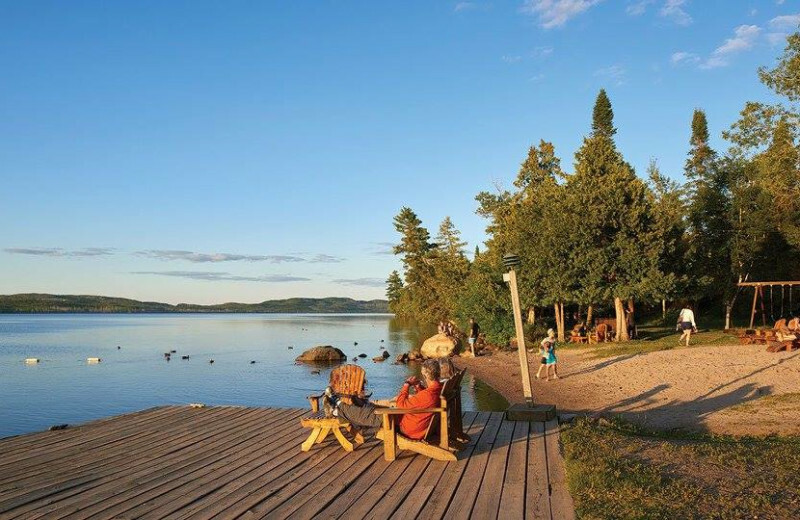 Yet you'll find a complete range of accommodations here, including bunkhouse-style lodgings with all the basics for an outfitted canoe or outdoor getaway. 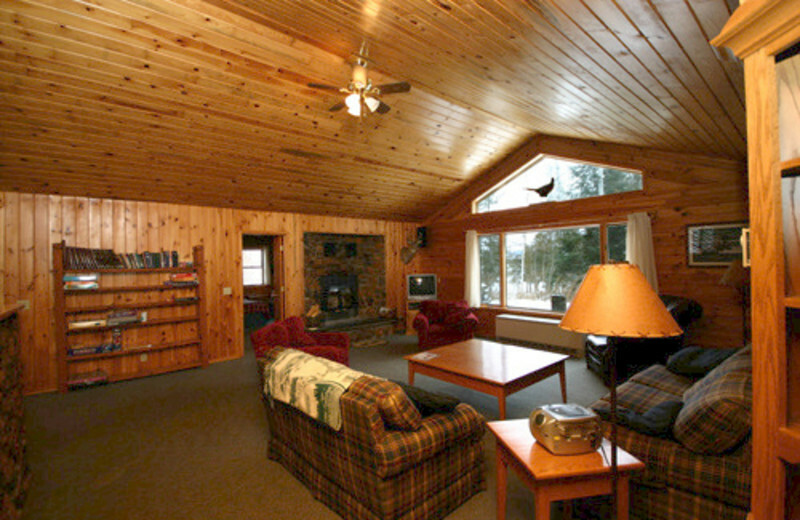 No matter what time of year you come, Gunflint Lodge is the perfect location for a holiday retreat! 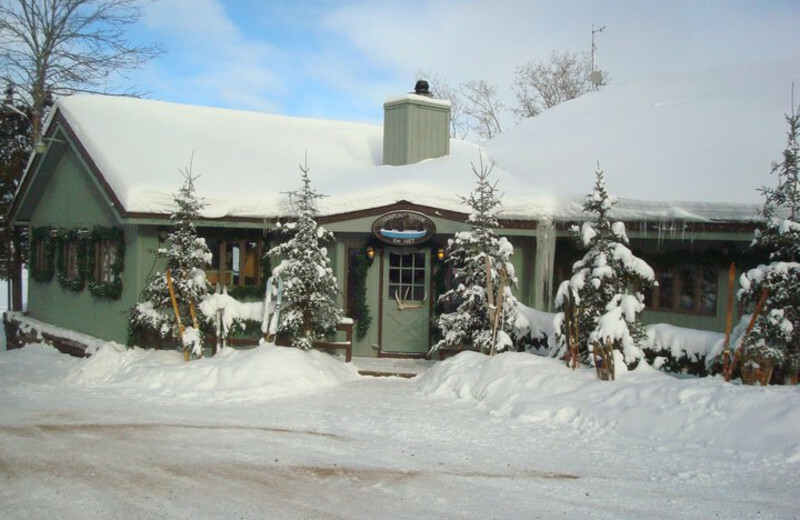 During the winter, come and experience cross country skiing at the lodge! 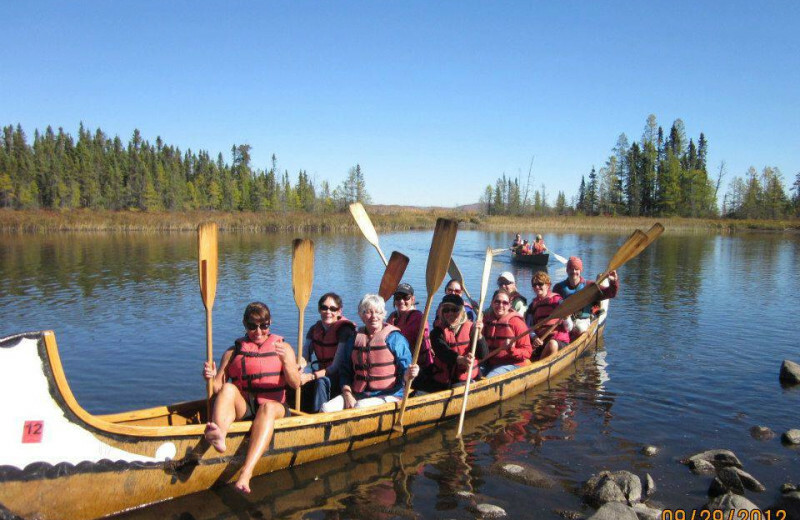 For a long weekend during the summer, head to the Boundary Waters for a river rafting trip that you'll never forget! 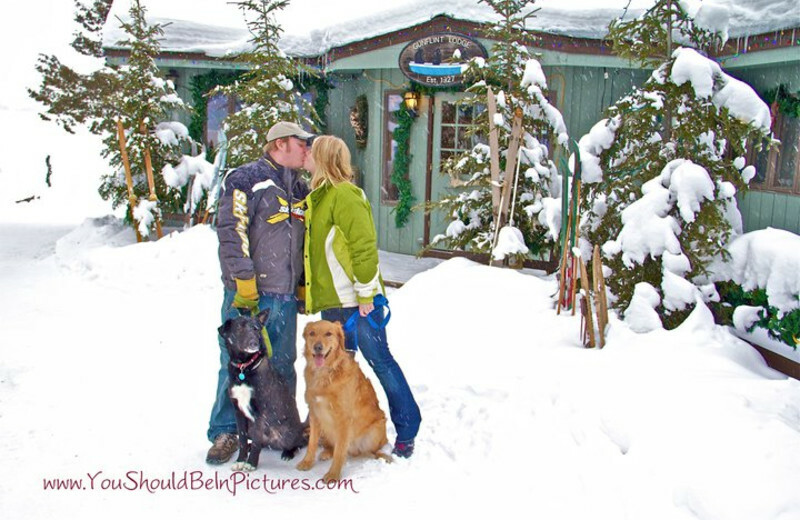 Book your next holiday vacation in Minnesota today. 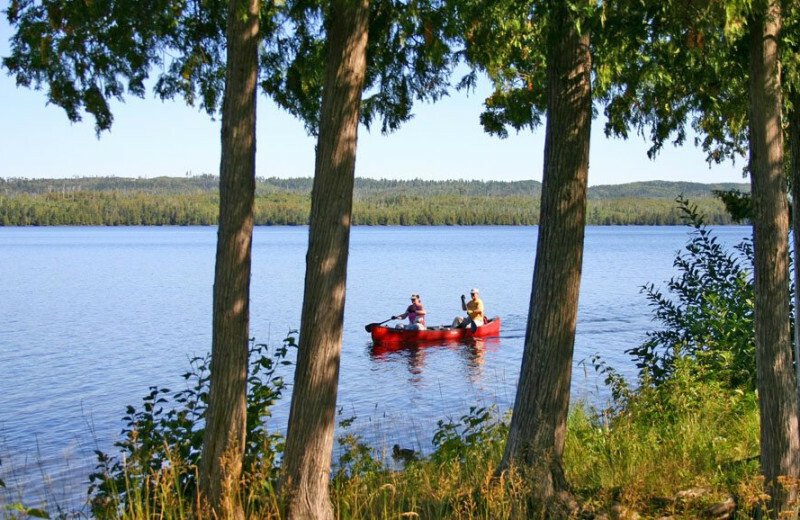 The Gunflint Northwoods Outfitters store provides your one stop shop for all of your canoeing and camping needs. 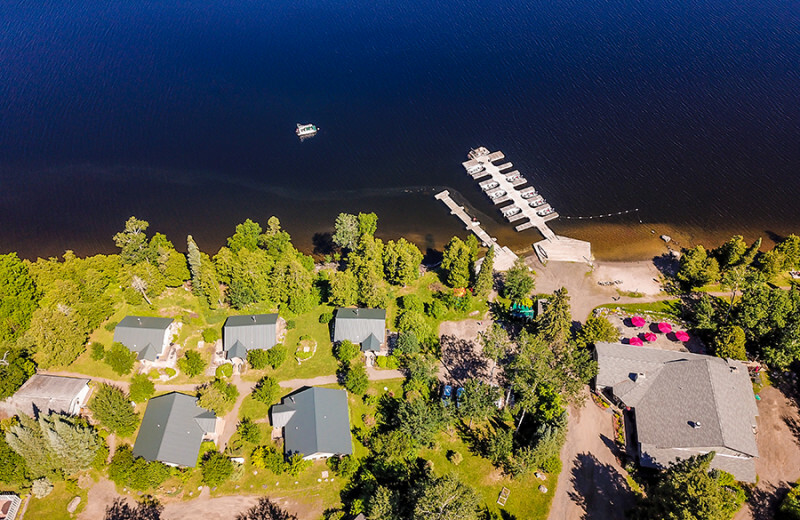 Whether you need the equipment to get in the water, or need a guide to help you navigate through the vast nearby waterways, the staff at Gunflint is always available to help you enjoy the best experience possible! 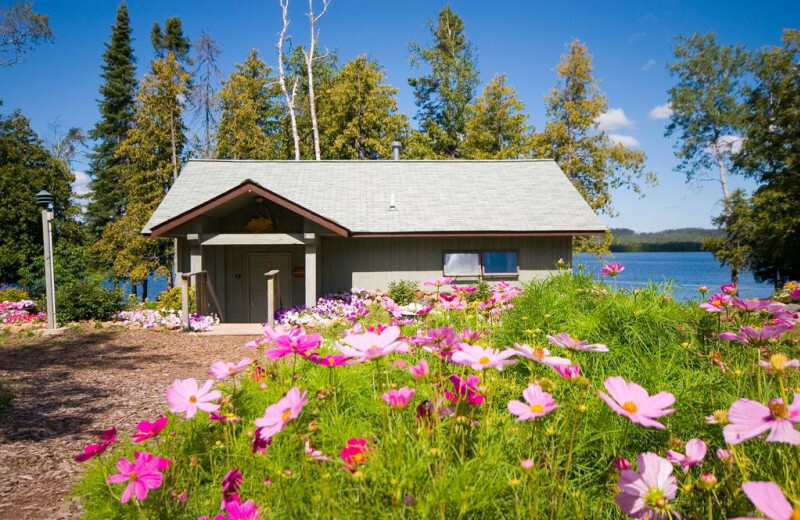 With a full time massage therapist, Gunflint Lodge really has it all! 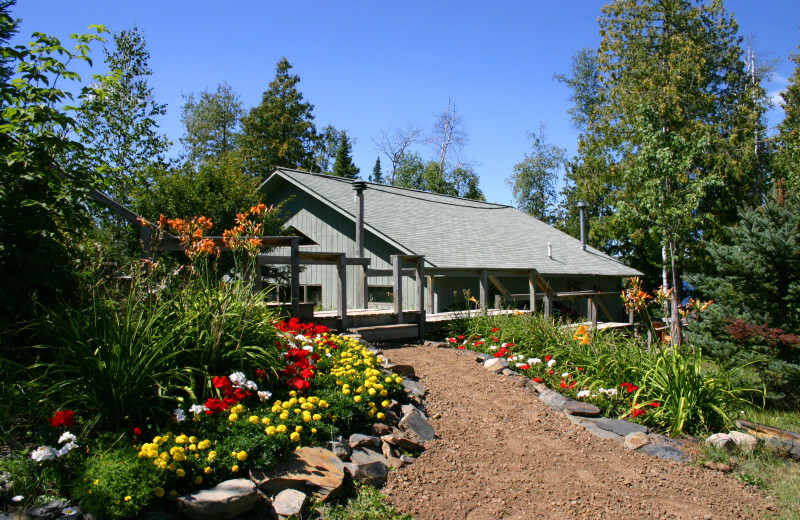 Indulge in a Swedish, Thai, Oncology or Deep Tissue massage while relaxing on your Minnesota North Shore retreat! Choose between 30 and 60 minute sessions, giving you the freedom to squeeze some relaxation and pampering into your fun-filled itinerary. 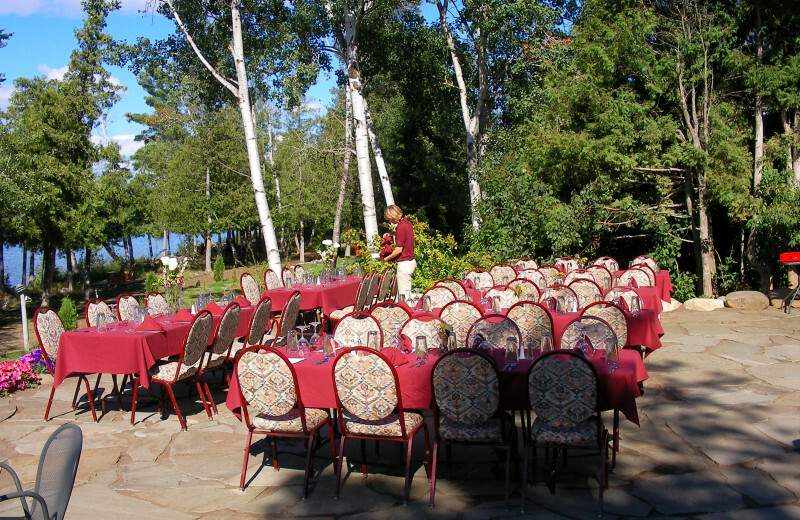 Plan your next group event at Gunflint Lodge. 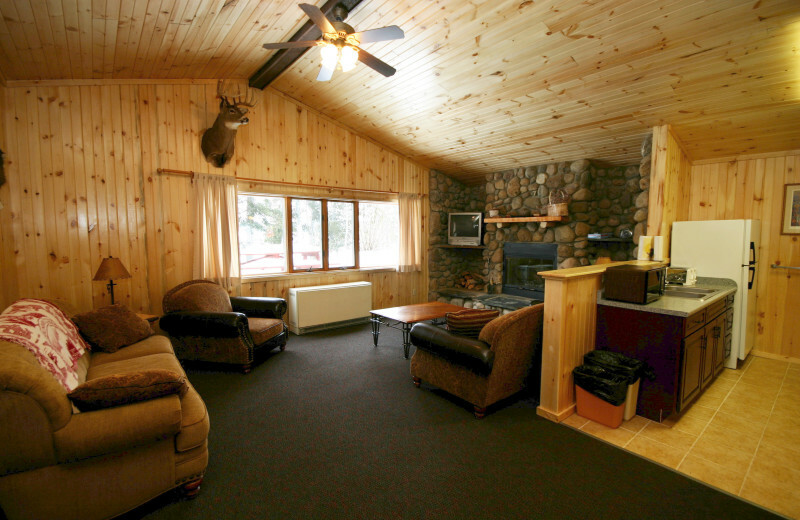 Gunflint Lodge is perfect for all Minnesota getaways. From family reunions to corporate retreats, they have all the amenities and recreation you need for a memorable time! For more information please call +1 (866) 241 - 3983 or Send Inquiry. Sometimes you just can’t get away for a long honeymoon, but still want to get away briefly to celebrate with the person you love. Or maybe your budget is tight right now. If that’s it, you can still enjoy a short time away being pampered with our Mini Moon Package. This honeymoon special includes everything we can put into a package for you. A romantic lakeside fireplace cabin. 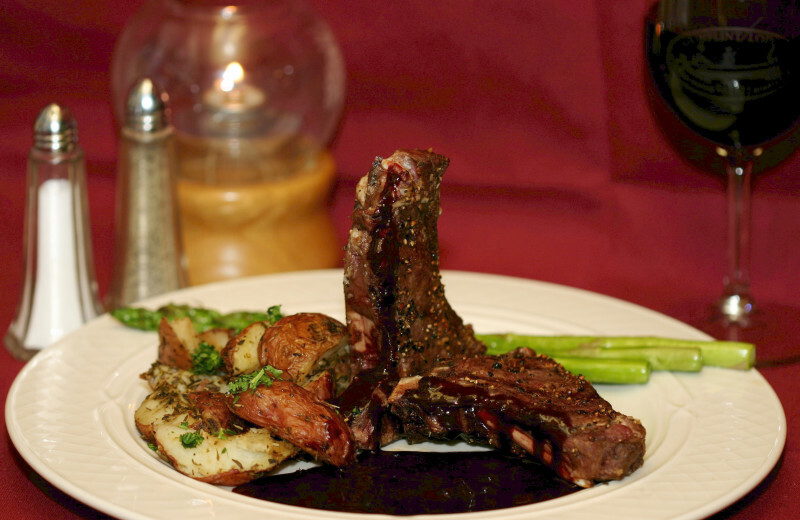 Gourmet meals, wine and appetizers delivered to your cabin each evening before dinner. Breakfast delivered each morning if you like. We’ll even pack your lunches if you want to take them along while you go out exploring. 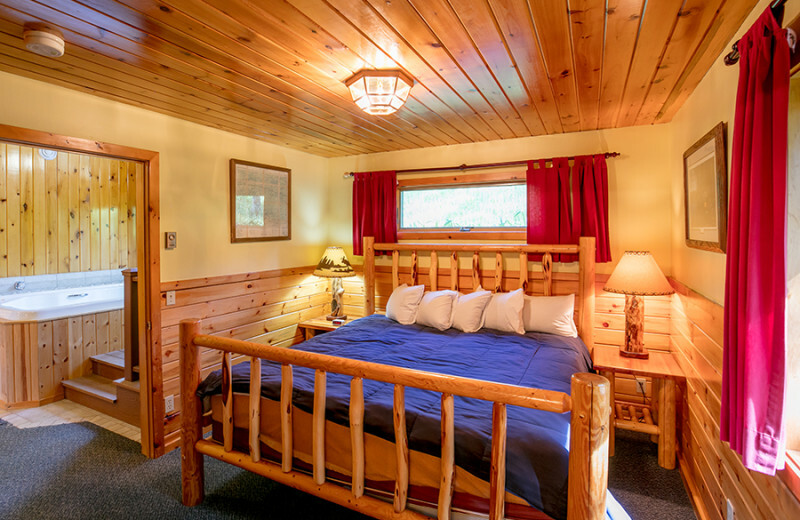 Your Romantic Honeymoon cabin is right along the lakeshore, and includes a king sized bed with cozy down comforter, spa tub, fireplace, full bath, steam shower, washer/dryer and a full kitchen. 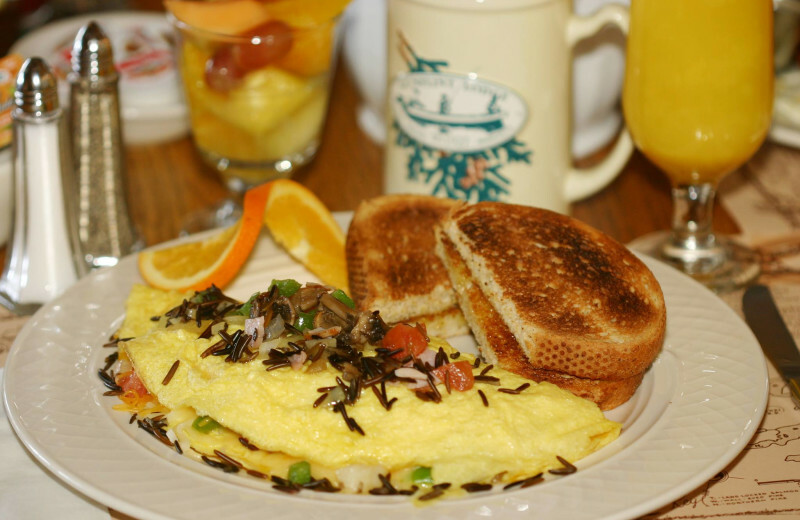 Meals start with a full breakfast either in the dining room at the Lodge or brought to your cabin (at your request). Lunches range from fresh salad plates to a selection of hot plates. For dinner you have your pick of several daily special entrées, along with soft drinks and a tasty dessert. During the day you’ll have lots of activities to choose from: unlimited boat and motor use, unlimited horseback riding, canoes, kayaks, hiking trails, swimming, feeding the ducks, joining some of the daily guided activities, or relaxing at the water front. Also included is a ride on our very popular Towering Pines Canopy Tour. 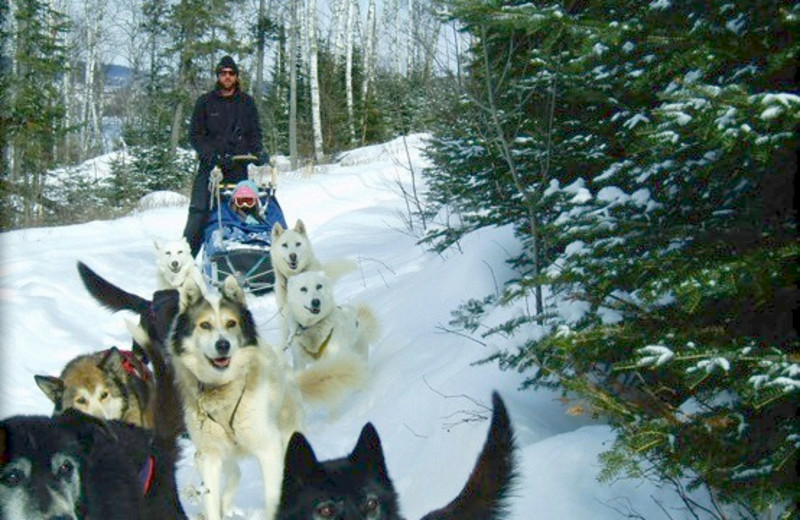 Winter activities include a dog sled ride, a half-day snowmobile rental, and unlimited use of cross country skis and snowshoes, as well as hiking trails and all guided Naturalists activities. 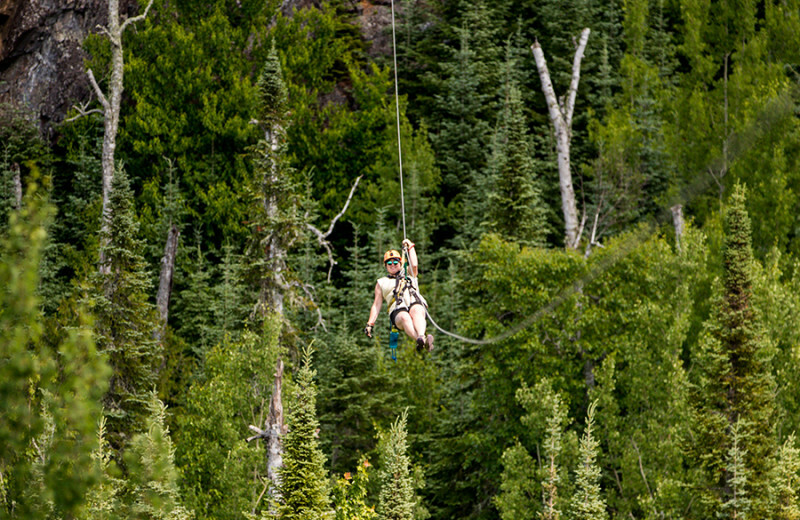 - One ride each on the Towering Pines Canopy Tour (based on availability mid-May through mid-October). 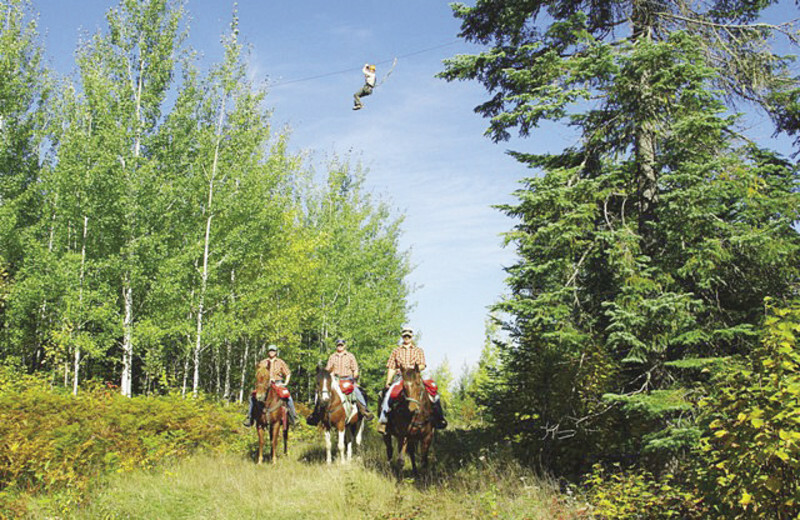 Guests must weigh less than 240 pounds for horseback and Canopy Tour rides. 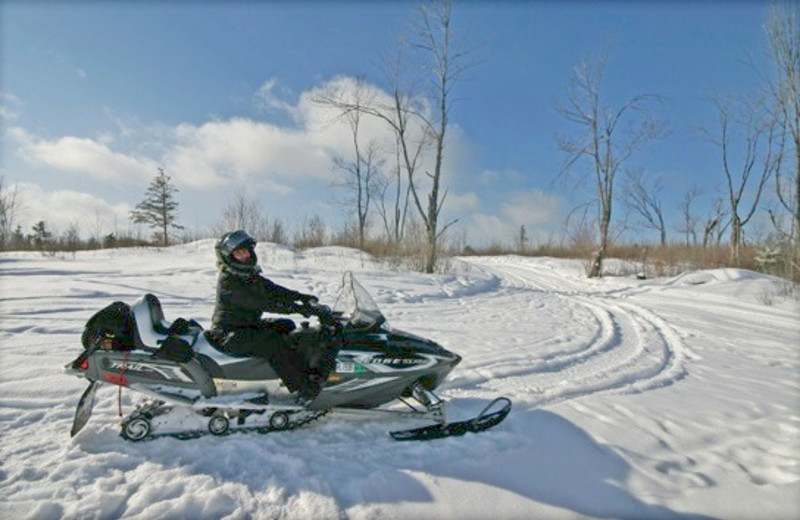 - One half-day snowmobile rental each (based on availability and weather permitting mid-December through March). Guests must be at least age 25 in order to drive our snowmobiles. Minnesota residents born after 12/31/76 must also obtain a snowmobile safety certificate from the MN DNR. Guides available for an additional charge and can be scheduled when you make your reservation. Taxes and resort fee are additional. 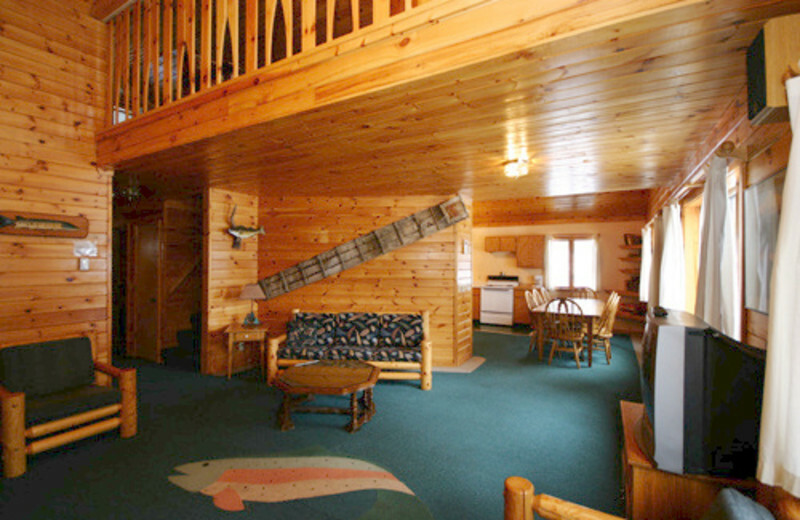 This property is ranked number 1 on Top Gunflint Trail Lodges & Outfitters. Read about it here.